"The Spicy Tuna roll is a classic. Relatively simple to make, works with different cut sizes of tuna and, well, very spicy. Check out the recipe below to learn how to make the sauce as well as the roll itself." 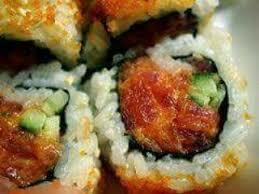 Spicy tuna is a common name for different rolls of sushi with two things in common: the use of tuna, and a spicy sauce. 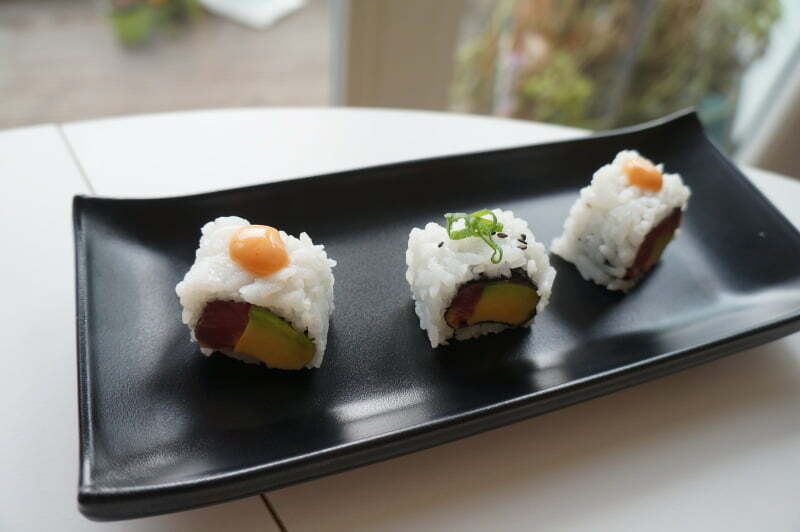 The tuna this roll is diced into small pieces, so the size of the initial block doesn’t matter. So it’s a great solution for odd shape blocks of tuna you might end up having that won’t fit any other roll. What gives the spicy tuna roll its kick is the spicy mayo sauce. You wouldn’t believe how easy that is to make! The following instructions are for making enough sauce to use in 4 ST rolls. My recommendation is to prepare double that amount and serving the remainder as dipping sauce. 1/2 tsp sesame oil (Kadoya’s). Mix all the ingredients in a bowl and, that’s basically it. Make sure to store in your fridge if not consumed right away. 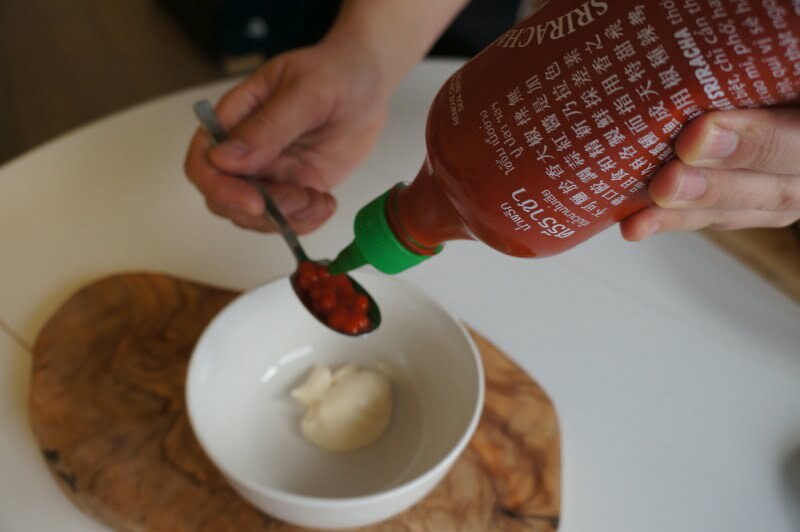 You can use a spoon to apply the sauce later to your roll or any other dish, or you can use a squeeze bottle if you have a spare one. The amounts you can see in the animated gif below are for one Spicy Tuna roll. First step, we need to break the nori in two. Make sure you break the longer side. If it doesn’t break easily, that means the nori may have already absorbed some moisture, probably from the air in the room. If that happens, try to toast it a bit over the stoves until it is crispy enough to break. Next, notice the nori has a rough side and a smoother side. Place the half nori with the rough side facing towards you. Wet your hands, and grab a handful of sushi rice. Shape it into a ball and place on top of the nori. With your hands still wet (otherwise the rice will stick) spread the rice along the nori to cover it equally. Don’t press the rice too much, just spread it. When you are done, flip the nori over so no the rice is facing the bamboo mat, and the smooth side of the nori faces you. Load the nori with good stuff! 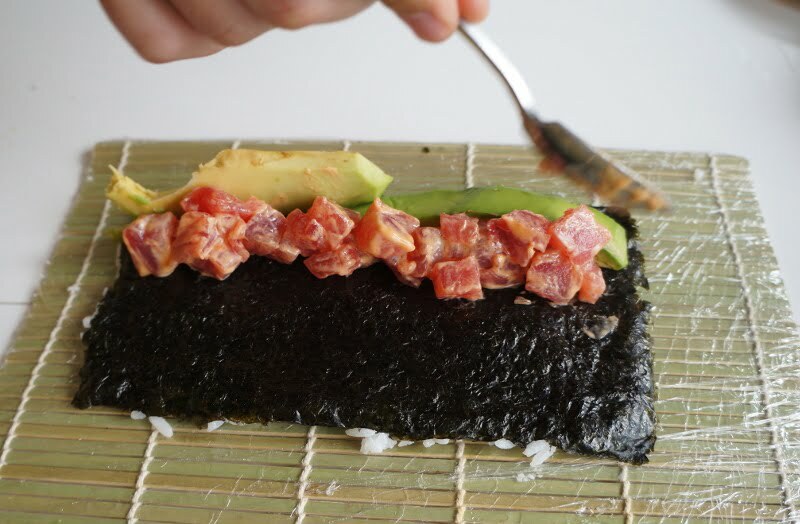 Two thick slices of avocado, and with a spoon load the spicy mayo soaked tuna dices. How much tuna to use is really up to you. A recommended amount is about 70g of tuna per roll. Both should cover the length of the nori as equally as possible as shown below. This is the fun stuff! Close the bamboo mat on top of the roll filling and tighten from the center to the sides. Push the mat forward in a rolling motion and tighten again until you reach the end of the roll. If you need more help on on this section, you may refer to our guide: How to roll inside out sushi. Use a sharp and wet knife to cut the roll exactly down the middle. Each half you can cut in either 3 or 4. When it comes to sushi, presentation is key. In the example below you can see two different toppings : Drop of spicy mayo (sides) or chopped chives and sprinkles of dark sesame (center). You could also top it with Panko, fish roe, maybe slices of mango? That sounds great to me. Hope you enjoy this recipe, and please leave your comments below. Oh my God.!!!!!!! I’m in,love with this. I’m eating it right now. My advice is to dip it in soy sauce and wasabi. It brings out the flavor. This is coming from a thirteen year old in home etc. Thank you for the recipe, it was very good!! Wow… I’ve been looking to learn how to make this. Glad I came across this recipes. I will try it out. many thanks. Interesting! I’m trying to understand the processes better though. May I ask if there is a video you’ve made that also explains this? I would love to watch. Thanks! Great read! I’m going to learn more of this here and hopefully use them to earn some bucks. Great site, Thanks. great recipe, had it at the friends house, made it myself now. Um … What kind of tuna do I use? Ahi is the best tuna to use, but make sure you ask your fishmonger if it is safe to be eaten raw. There are different health and safety standards for fish that is sold to be consumed raw. This is a good recipe, but you don’t mention how much tuna to use. How much do you recommend for this recipe? Hey James, you’re absolutely right. The recommended amount is 70g of tuna per roll. I’ll add that information to the post as soon as I can. Thanks for taking the time to make the note. Very clear for a first timer, thank you. What a breakdown. I thought this was going to me very complex. You really simplified the steps. Thanks for sharing! I owe much thanks to this site and the person behind this. I have earned some passive income from what I learnt here. Many thanks! It says to use cubes of tuna, but when I go to sushi restaurants the tuna doesn’t looked cubed; it looks more like smashed. Which is better? That is because at a restaurant the but the whole tuna, cut the meat portions out for rolls, sashimi and nigiri. Then the leftover meat that cant quite be cut out, scrapped out with a spoon and used for spicy tuna. I worked as a GM in a sushi restaurant for years..
Can I use canned tuna ? This is more of a should vs can I question. You can, but you shouldn’t. Yes you can. I recommend an albacore if your gonna do it. I also have done with salmon and it is very good.